A survey of job seekers, conducted by iProfile, in January 2012, has revealed a picture of an increasingly flexible and liquid labour market, with more candidates than ever open to contract roles. 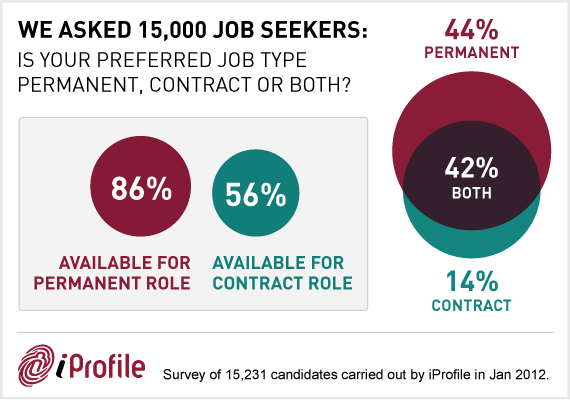 iProfile asked 15,000 IT and Engineering candidates in the UK, “Is your preferred job type permanent, contract or both?”. The results showed that 86% of respondents were open to offers for permanent roles, whilst 56% were open to contract roles. Figures from the National Office of Statistics, for the fourth quarter of 2011 show a dramatic increase of 4.2% in the number job seekers accepting contract roles. The most common reason being that a permanent role was just not available at the time. In fact, the number of contractors whose first preference was a contract role dropped by a massive 7.9%. The current economic outlook is uncertain, making employers pensive and jittery. For many companies, jobs still need to be filled and contract roles appear to offer employers with a lower risk alternative to full time placements. “Employers seem to have adopted a much more cautious approach to hiring to see them safely through the economically uncertain climate” says Managing Director of iProfile, Mark Callahan. With candidates increasingly filling more short-term placements, it has become even more critical for recruiters to find ways to increase levels of engagement with their candidates. 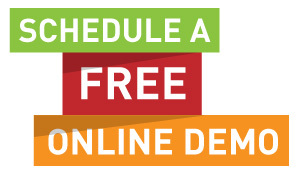 “These results point to an increasing need to maintain a more up to date CV database. Candidate experience and skills will need updating more frequently now with many contractors changing roles every 3 to 6 month”, says Mark Callahan. Recruiters ought to be asking themselves how they can best utilise their resources to keep their candidate information up to date. If this is not addressed now the risk is that the quality of internal talent pools will quickly diminish and opportunities to make placements could be missed.